Can passengers wear them to? I want to buy this item. Please send the details thru my email. Thanks. How can I by it in Portugal?and price please? This seems like an amazing concept! And I hope it goes further then a concept! 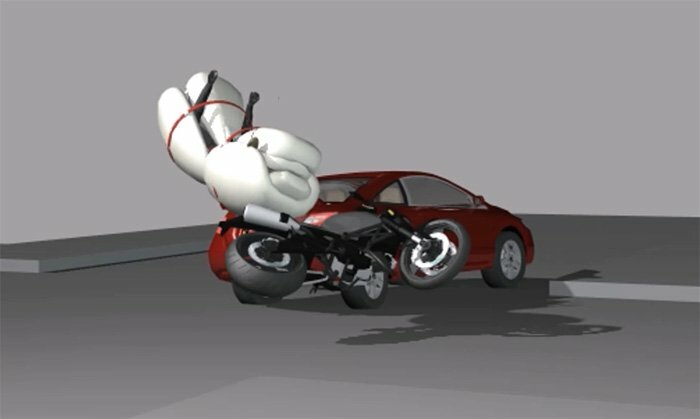 Is this motorcycle airbag available in South Africa? How long after deployment would the airbag deflate? I am concerned about breathing while the airbag is inflated. Super idea. Should be worth to think about. Many top bikes cost more the 20k Euro. Such a system would justify those high prices. I would love it in a BMW 1200 GS. Where can I get this air bag in the UK. I think it’s a very good idea and would wear it. Clearly not in production yet. Seeking investors, obviously to further develop the concept and bring it to life. Great idea.